Week 3 of the You Matter Marathon and the momentum and magic are magnificent! By our estimation we have shared at least 238,000 You Matter cards! We thank our Ambassador organizations including Acton Boxborough High School, Innovative Mental Health and Pain Care, LLC, and The Housewives of Tattie County. Check out the rest here. We also added 2 more countries: Guatemala and Mauritius to bring our total to 56. Our global community now consists of 14,365 YuMMies. Click here to order more You Matter cards from Vistaprint. Use discount code THANKS20 and print the card on Signature Glossy cardstock. For the purpose and duration of the You Matter Marathon please do not customize the card in any way – not even adding the YMM web page. Click here for a template of printable You Matter cards. We now have a way for those who receive a You Matter card, and for anyone involved in the YMM, to share their experience even if they aren’t on Facebook. Just click here and you’ll be taken to our You Matter Marathon Guest Book. The link is also at the top of the YMM home page. Continue posting stories, photos and video on our YMM Facebook page or in our YMM Guest Book. The best part of my day is reading your stories and seeing your pictures. Invite those who receive a You Matter card to share their experience in our YMM Guest Book. 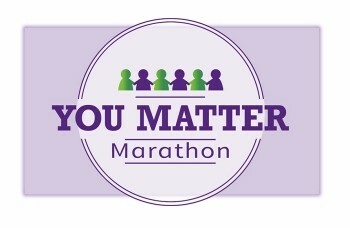 We will have You Matter Marathon Celebration calls on December 5. You can choose from one of three times to accommodate our global community. Calls will be at 7:00 a.m. EST, 2:00 p.m. EST, and 9:00 p.m. EST and last no more than an hour. Thanks to all of you for continuing to spread the You Matter magic.